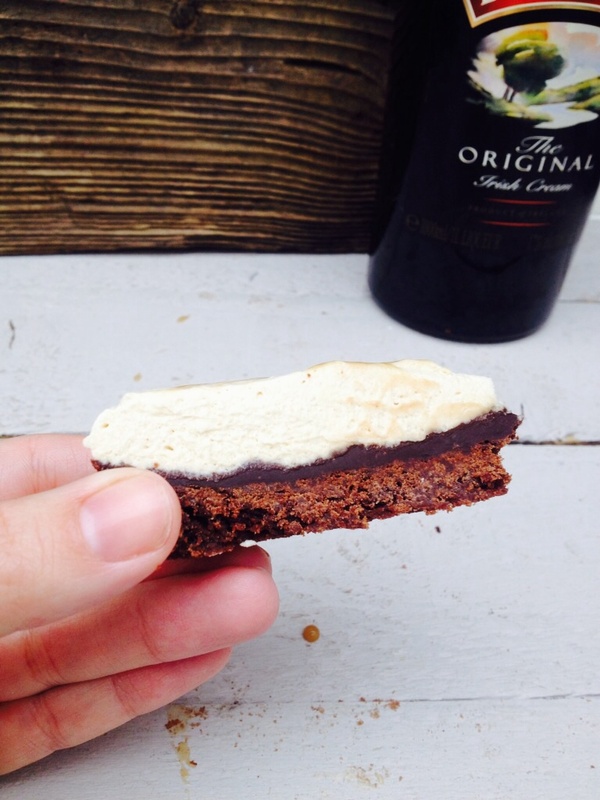 When I was asked by Baileys to create a recipe for them I was immediately swamped with ideas. 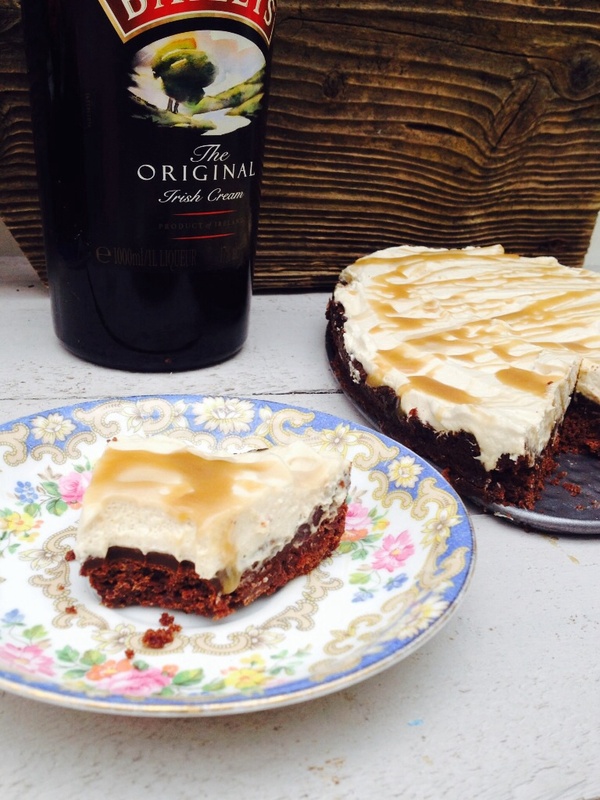 I’ve used the famous Irish Cream to cook and create with on numerous occasions.. I’ve made Baileys cheesecake, Baileys Fudge, After Eight Cocktails and Baileys Cupcakes. But what to do that I hadn’t done before..hmmm. I finally came up with this Baileys Cream Pie. I’ve made a few pies of this type over the past year using what Americans would call a cookie crust. I know that in lots of stores in America you can buy ready made cookie crusts to fill and serve. 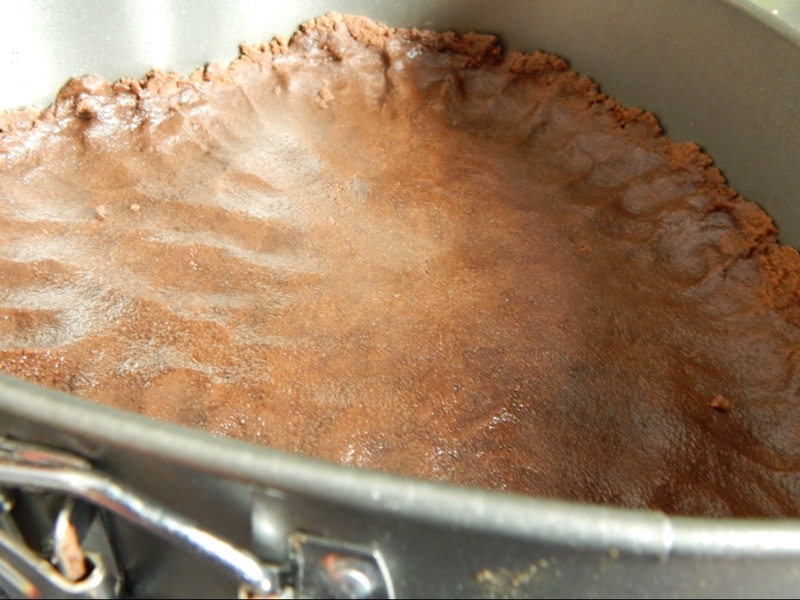 There are also lots of recipes online for cookie crusts using graham crackers or Oreos. I use Bourbon Creams for mine ( typically whatever store brand I happen to be shopping in at the time ). I knew I would want my salted caramel sauce in there somewhere..as it’s amazing and I thought it would be nice to have my favourite dark chocolate Baileys fudge in there too so after much indecision I ended up with a bourbon crust with a layer of Baileys dark chocolate fudge which was topped by a thick layer of whipped cream with salted caramel sauce mixed in and drizzled on top. The components individually were delicious but how did they work together? It’s important to note that this recipe contains a moderate amount of alcohol so is not suitable for anyone under 18 or anyone who for any reason cannot tolerate alcohol. The amount of alcohol is just enough to flavour the pie without overpowering it. Let’s start with making the crust as you need this to cool, cook and then cool again before adding your other layers. 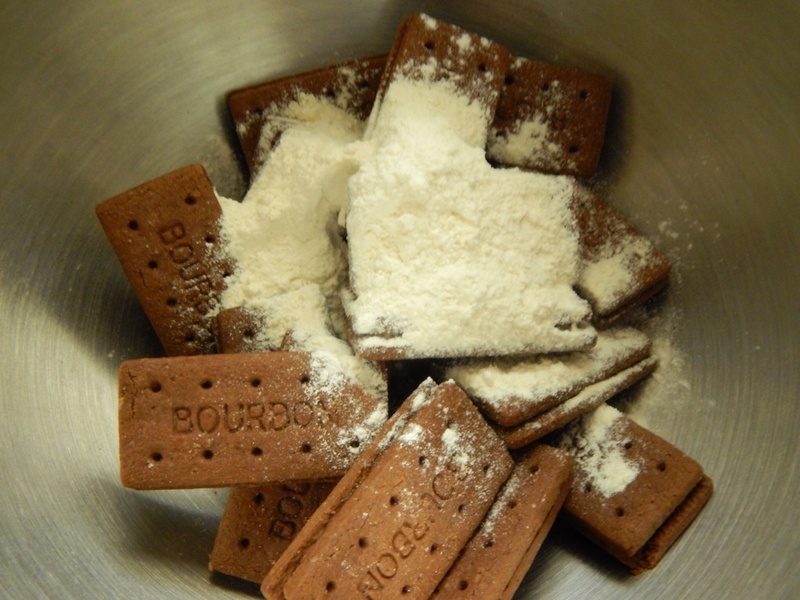 Blitz your bourbons with your flour until you have a fine crumb, add your butter and press into a pie tin. 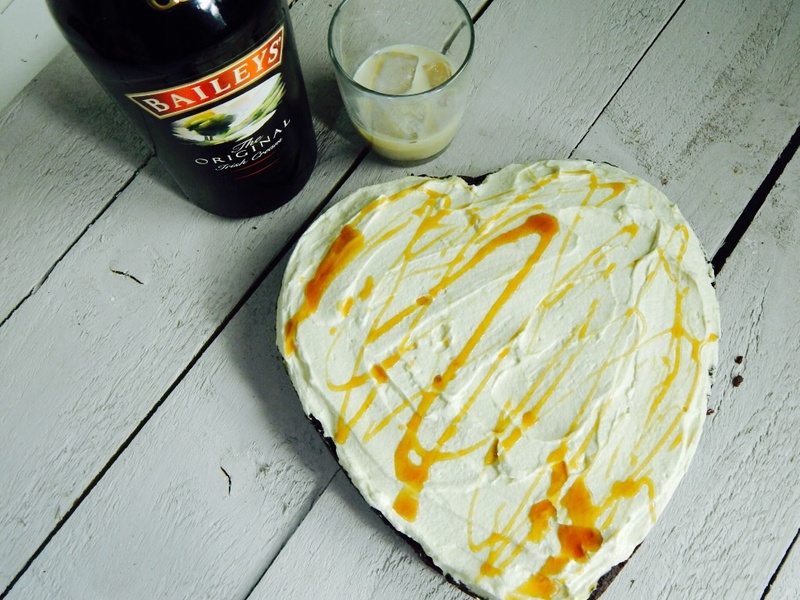 I used a loose bottomed heart shaped tin because I HEART Baileys. 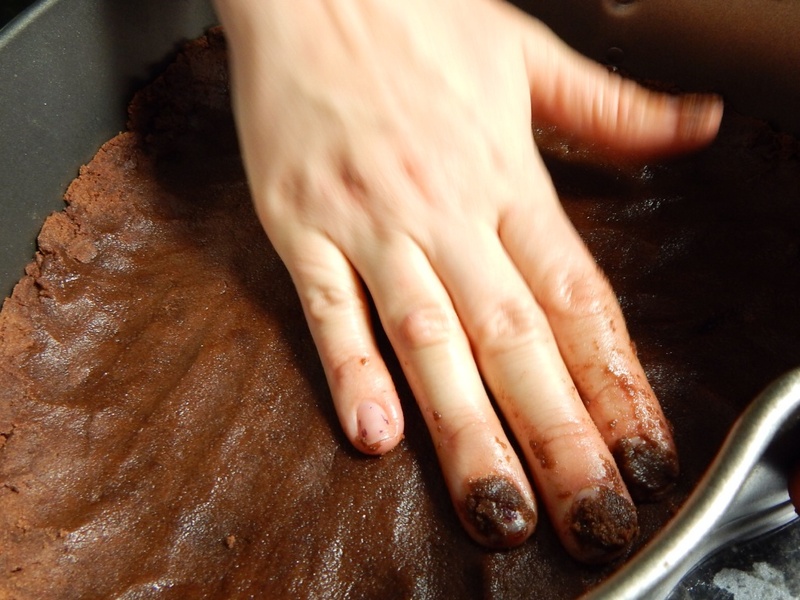 You need to use your hands to flatten and push your crust slightly up the side of the tin – there is no way to do this without using your hands and it’s a messy job, sorry about that. Now cool in the fridge for about 20 minutes. 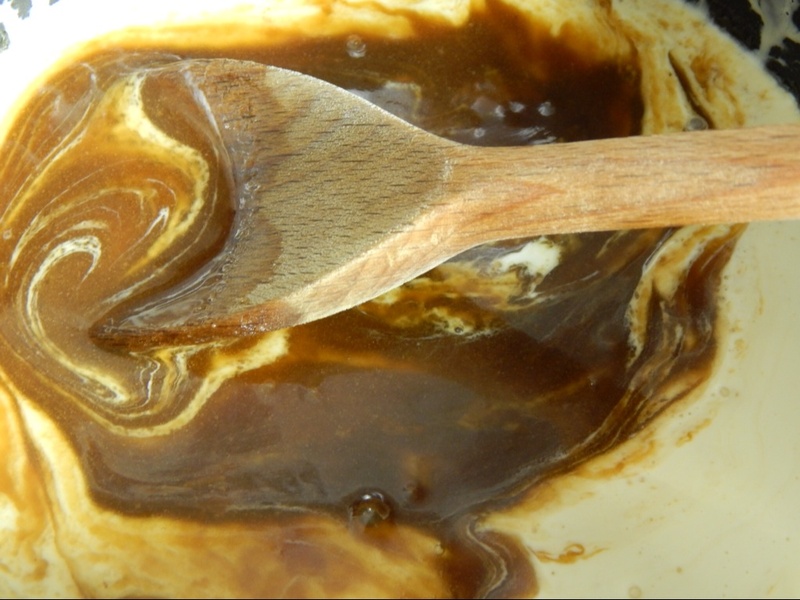 Whilst it’s chilling you can move onto the next stage of making your salted caramel sauce. 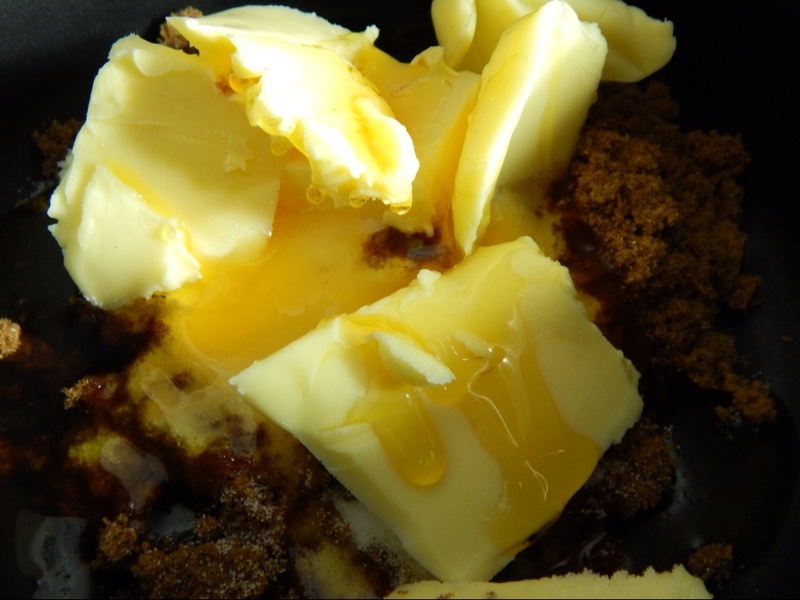 Put your sugars, syrup and butter into a saucepan and melt together over a low heat. Pour into a jug and leave to cool and thicken in the fridge and then start to prepare your ingredients for your fudge below. Don’t make it just yet. Remove your crust from the fridge and bake in a very hot oven for about 15-20 minutes. Keep a close eye on it as you want it to crisp around the edges but not burn. Remove from oven and leave to cool but do not remove from tin. Slowly heat your condensed milk in a heavy based saucepan and add your chocolate ( broken into chunks) and stir occasionally until melted and combined. Remove from the heat and stir in your Baileys. 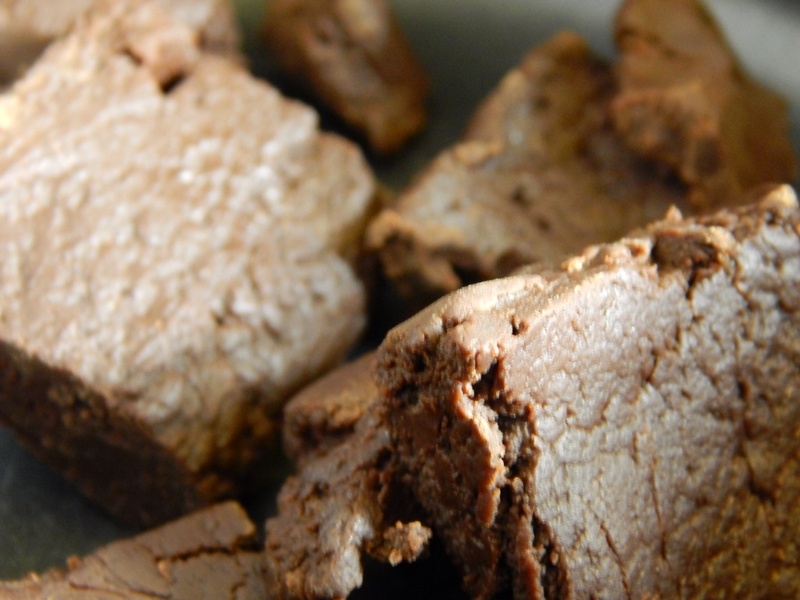 Tip about half of this into a lined baking tray and chill – this is delicious eaten as chunks of fudge. Rich and indulgent. 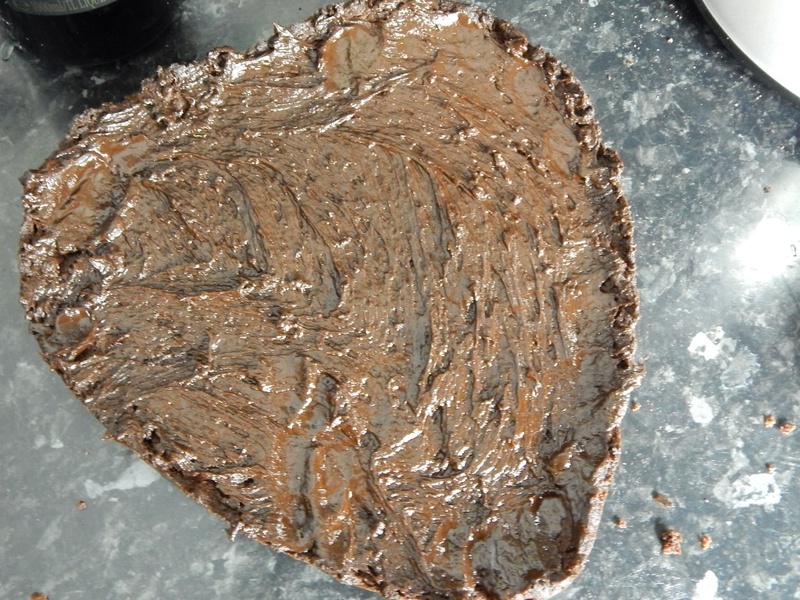 The other half ( about 200g ) will be used to cover your base as a fudge filling. 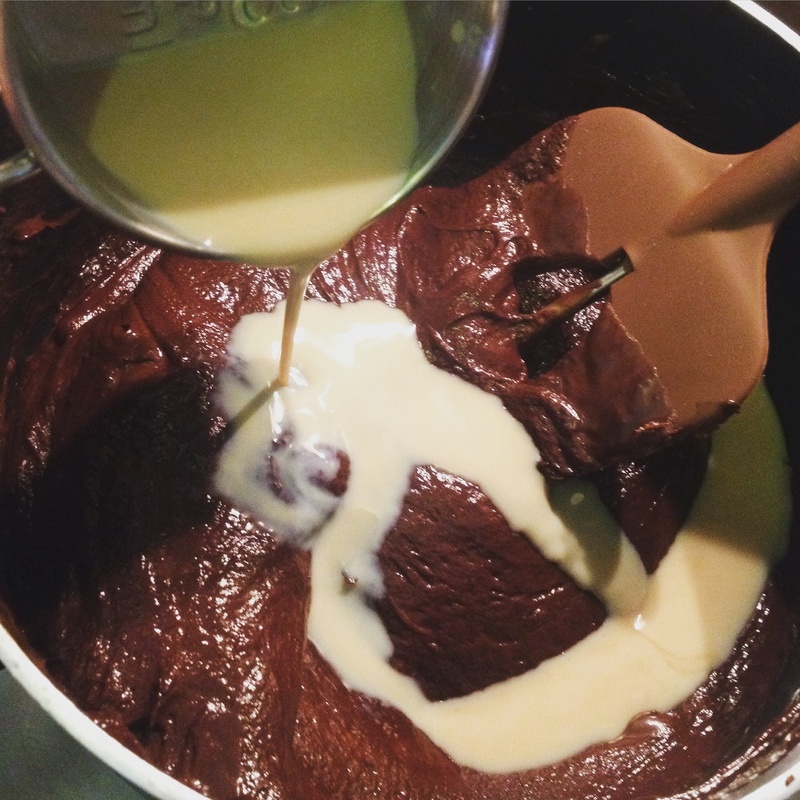 Once your have fully covered your base with the fudge, place into the fridge to chill completely. Whip your double cream until forming soft peaks then very slowly add your Baileys and whip again, once fully combined you should start folding in your salted caramel. Remove your pie crust and add your cream using a spatula or knife to get an even coverage over the pie – use all the cream. Cover and chill in the fridge overnight. Remove from fridge at least 30 minutes before you wish to eat it. Just prior to serving drizzle the top with the remaining salted caramel sauce. This is an extremely indulgent dessert and I recommend you serve it at a dinner party in small slices or as we did as a Sunday lunch dessert with some of our extended family ..otherwise it would be altogether too tempting to eat a little too much! The whole pie contains just over 2 units of alcohol. *I was provided with a bottle of Baileys to create this recipe and compensated for my time.